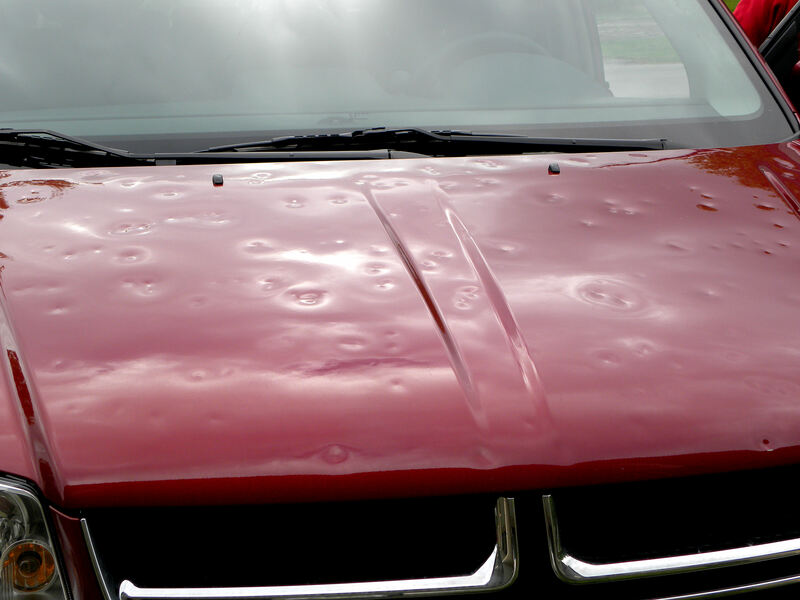 Posted on May 12, 2011	by Lou Murray, Ph.D.
My column in the Huntington Beach Independent this week is about the hail storm that hit our rental car as a group of us photographers were driving from Nashville to Townsend Tennessee on April 27. We got caught in the periphery of a funnel cloud between Maryville and Alcoa, and were hammered by hail. The car was most likely totaled from all the body damage, but we were unscathed. I promised my readers more photos from the trip, so here are some highlights, plus videos. We had five photographers from the Photographic Society of Orange County in the car. We had about nine cameras between us, but we didn’t get one single shot of the hail that pounded us near Alcoa. Too busy worrying about staying alive. However, our formerly beautiful Dodge Caravan rental became one of the most photographed features of the trip. The hood and roof looked like they had been attacked by a maniac with a ball peen hammer. The passenger side of the car was also severely damaged. 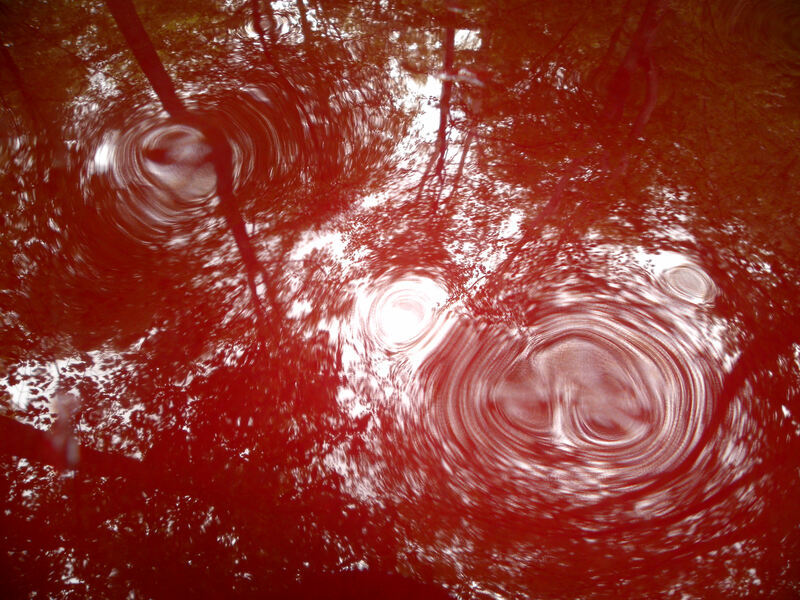 Magnificent hardwood trees reflected in the dented hood made wonderful patterns. 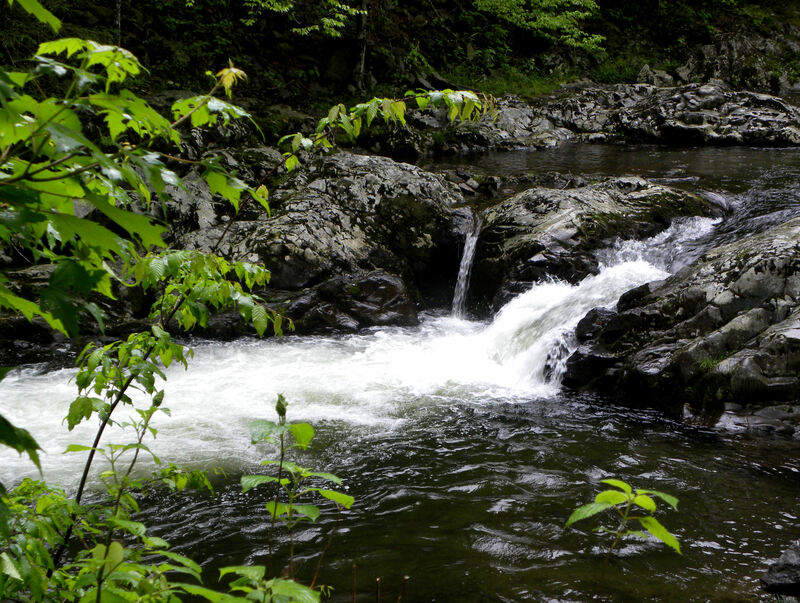 Every turn of the road brought a new vista of waterfalls and wildflowers. Coming from dry southern California, it was a real treat to see all of the water. We managed to find a few flowers that hadn't been beaten down by the storm. Here is a trillium. Trillium also comes in yellow. Great Smoky Mountain National Park is an ecosystem I'm not familiar with, so I can't identify many of the plants, like this flowering tree. 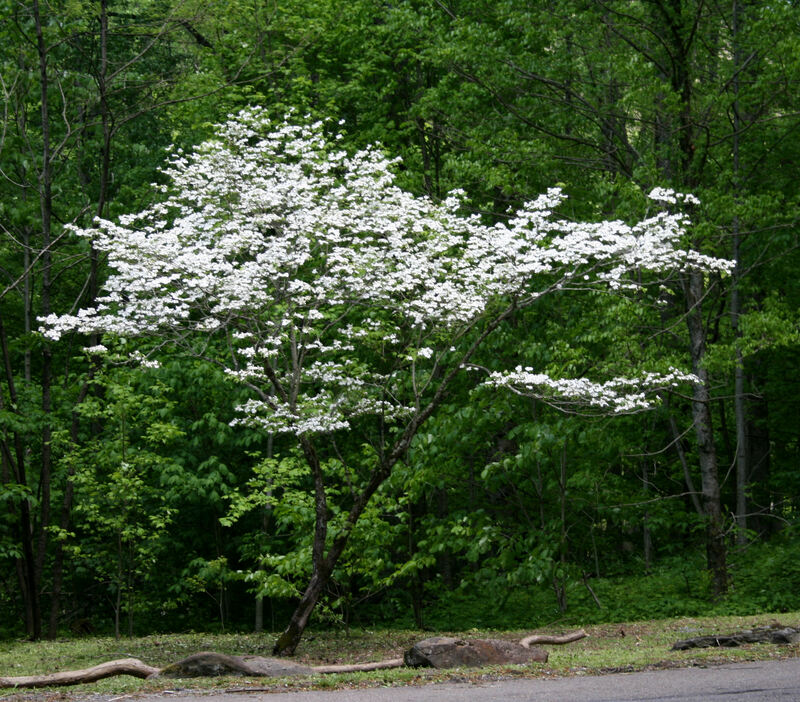 Flowering dogwood is a tree that I recognized. 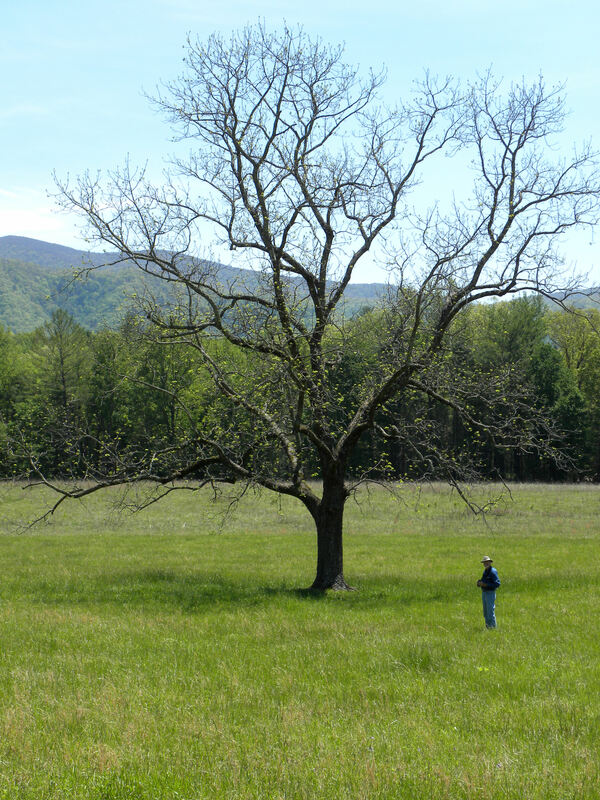 Cades Cove was my favorite place in the park, and we visited every day. 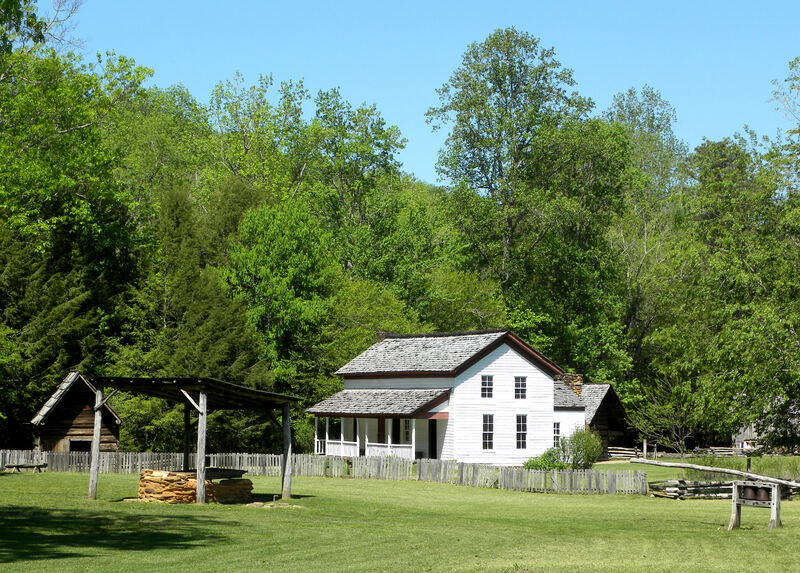 Cable House and many other historic structures have been preserved so visitors can get a feel for what life was like in the 1800s in this part of the Appalacian Mountains. 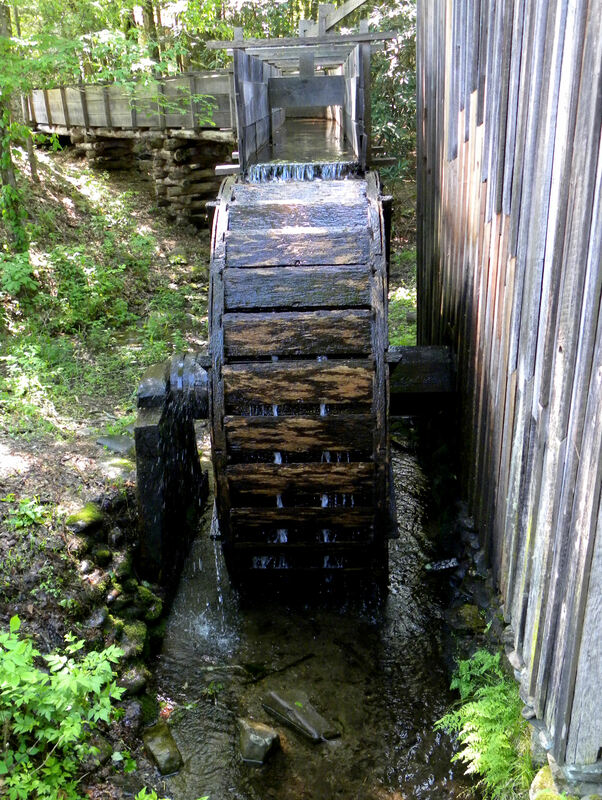 Cable Mill still grinds corn and wheat, and visitors can purchase stone-ground cornmeal and whole wheat flour there. Vic was frustrated by all of the strange bird calls. The birds were well hidden in the trees, so they had to be identified by sound. 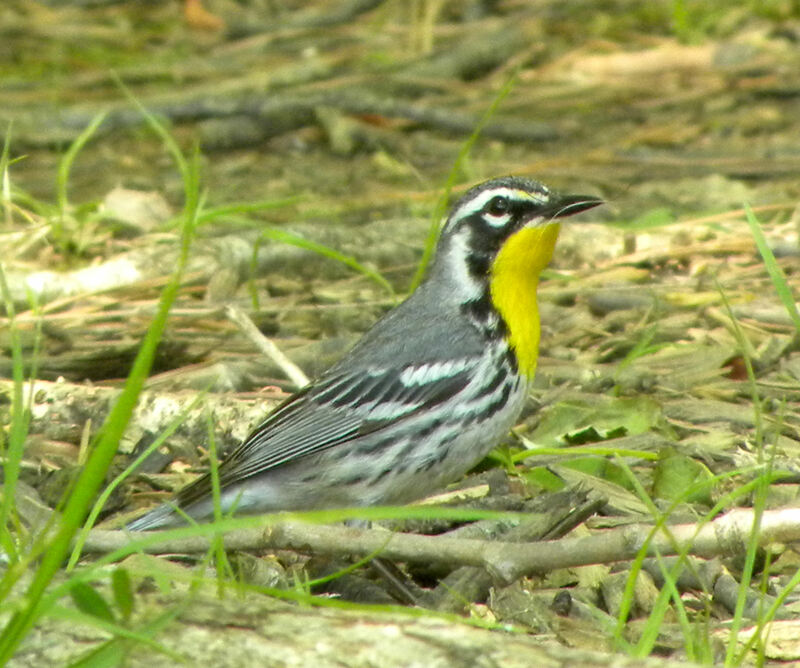 This yellow-throated warbler was amazingly cooperative about being seen (and photographed). 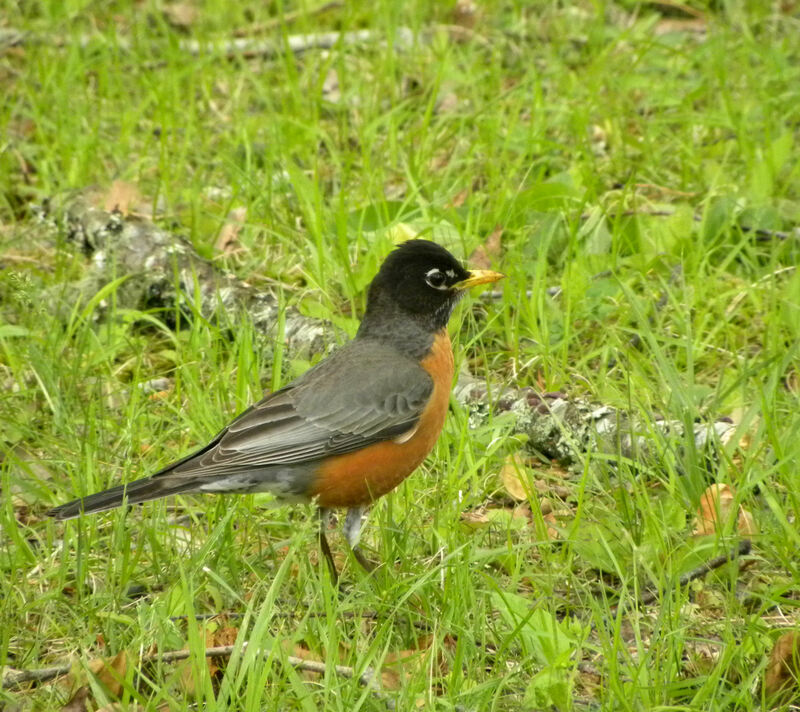 It's only a robin, but it held still long enough to be photographed. 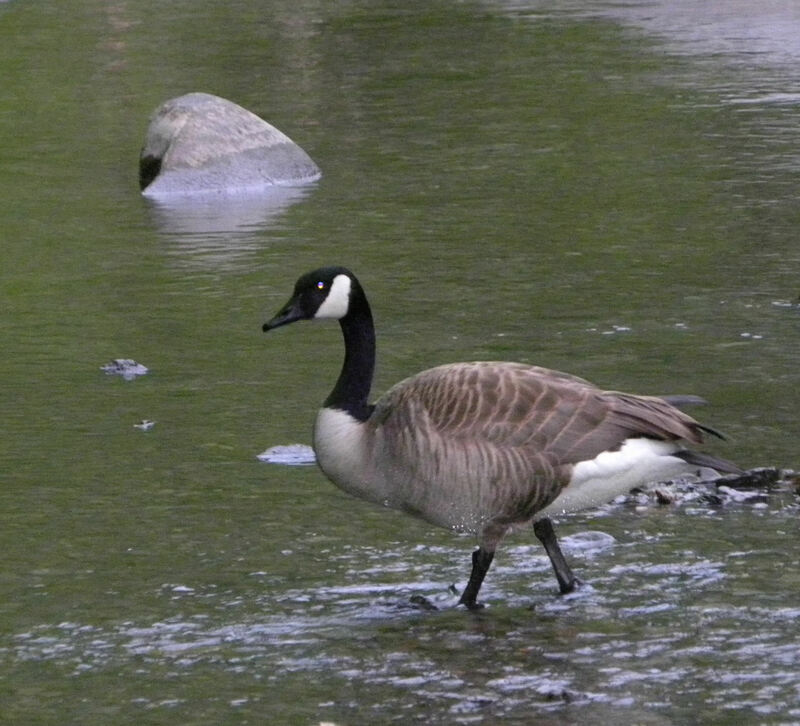 Canada geese were fairly common on Little River. Wild turkeys were common sightings. 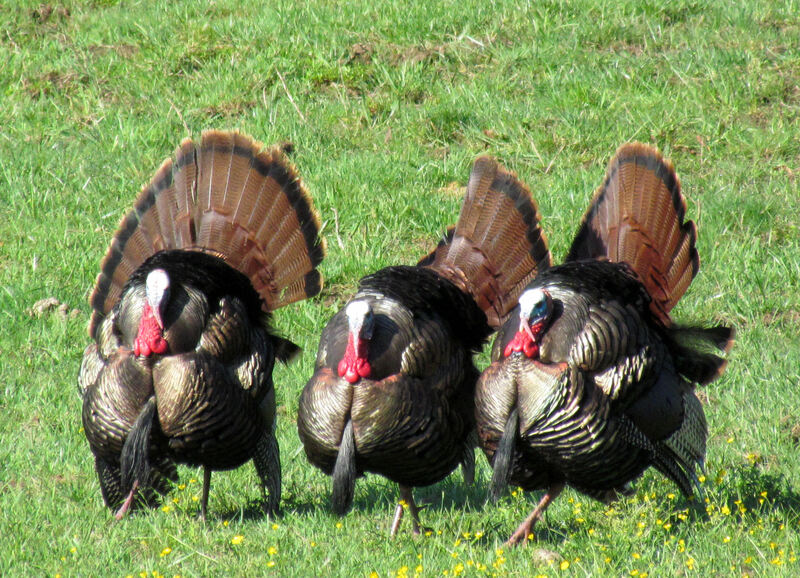 These three toms were strutting their stuff, trying to impress a hen. 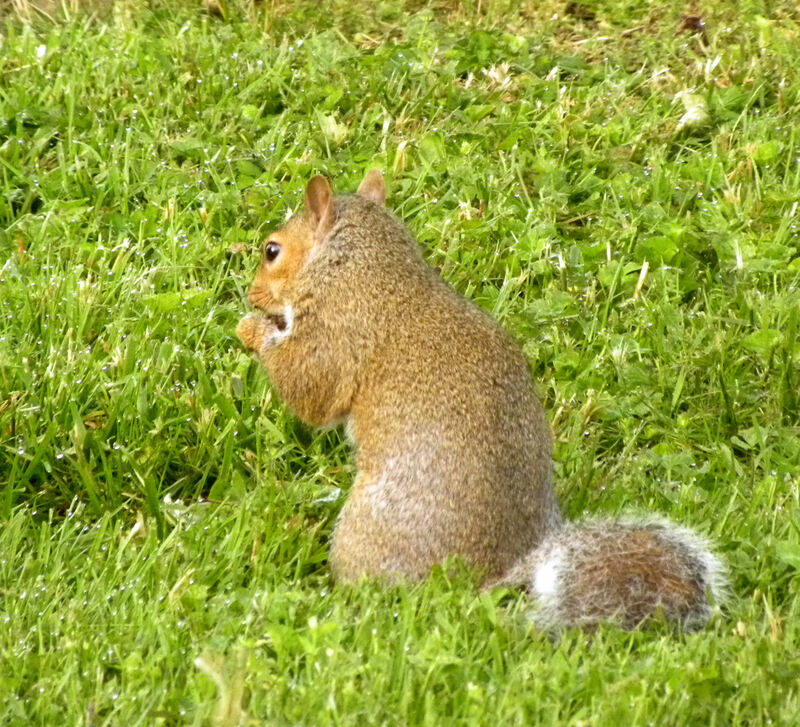 Squirrels were fairly common on the lovely grounds of the Highland Manor Inn, where we stayed. Very nice motel, beautifully landscaped. 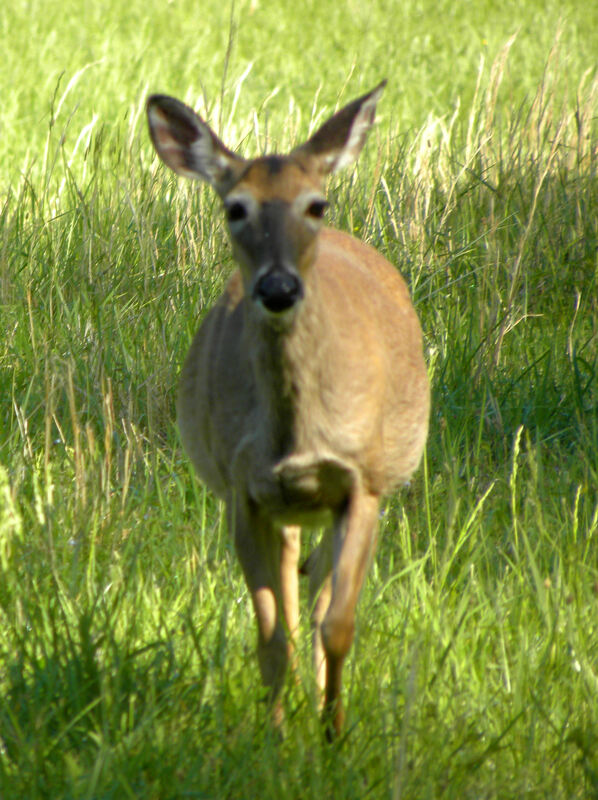 Vic got this great shot of a deer in Cade's Cove. 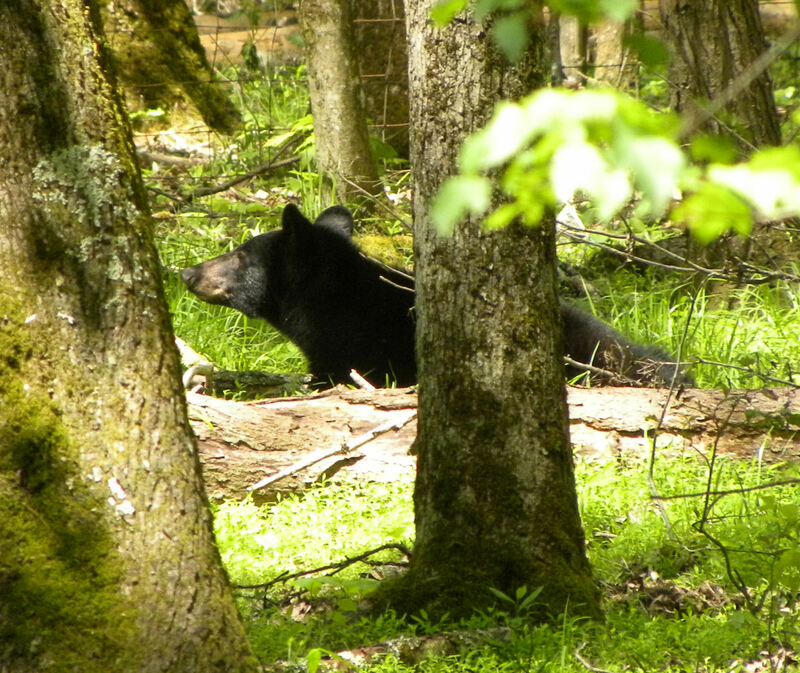 He also got this photo of a mama bear resting in a gum tree swamp. 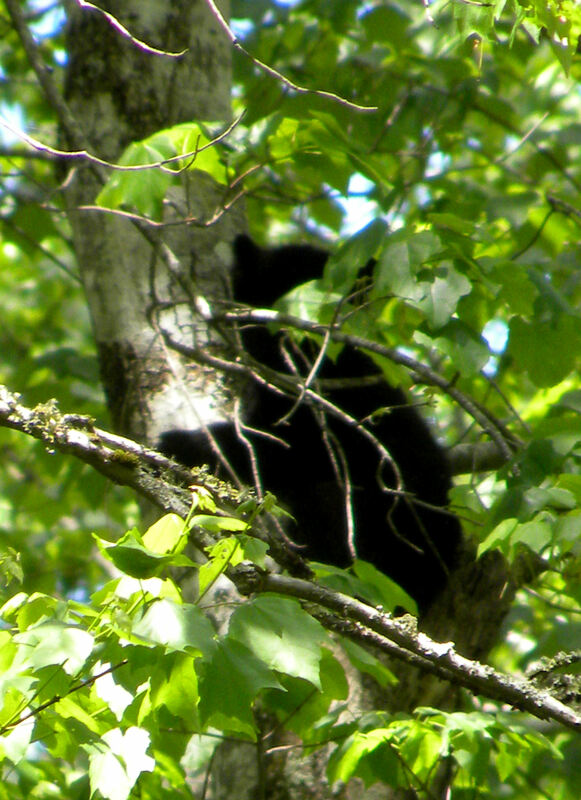 Her cub was up a tree, resting in a crotch. 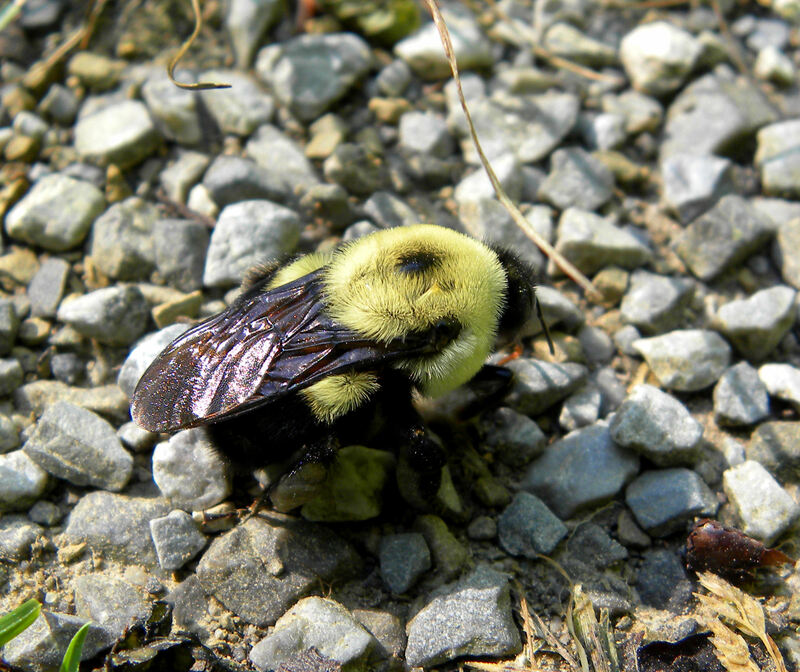 Wildlife also comes in small sizes, like this bumblebee. 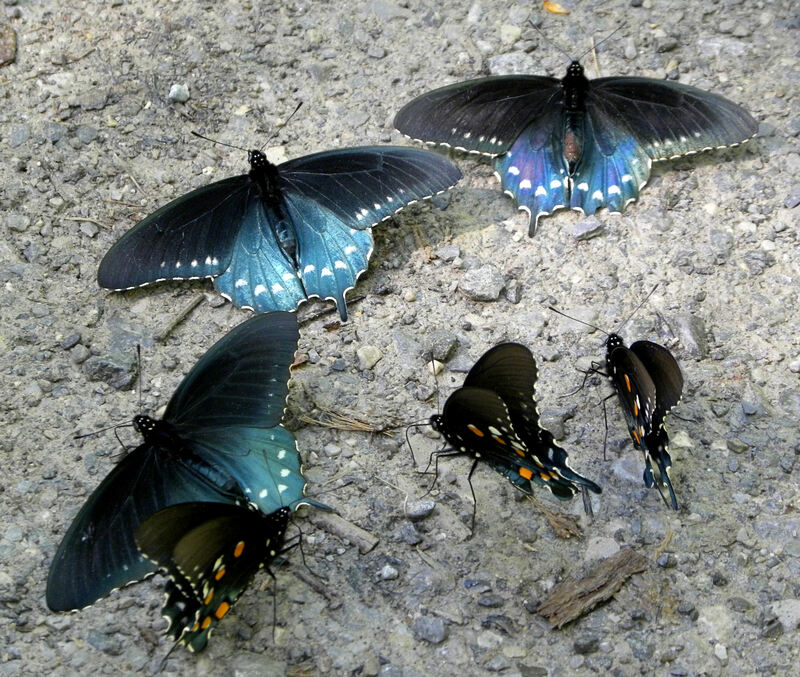 One of the most fantastic sights was swarms of black swallowtail butterflies, hundreds of them, engaging in a behavior called puddling. They require sodium, and get it from salts at the edge of puddles. They will sit quite still for photographs. 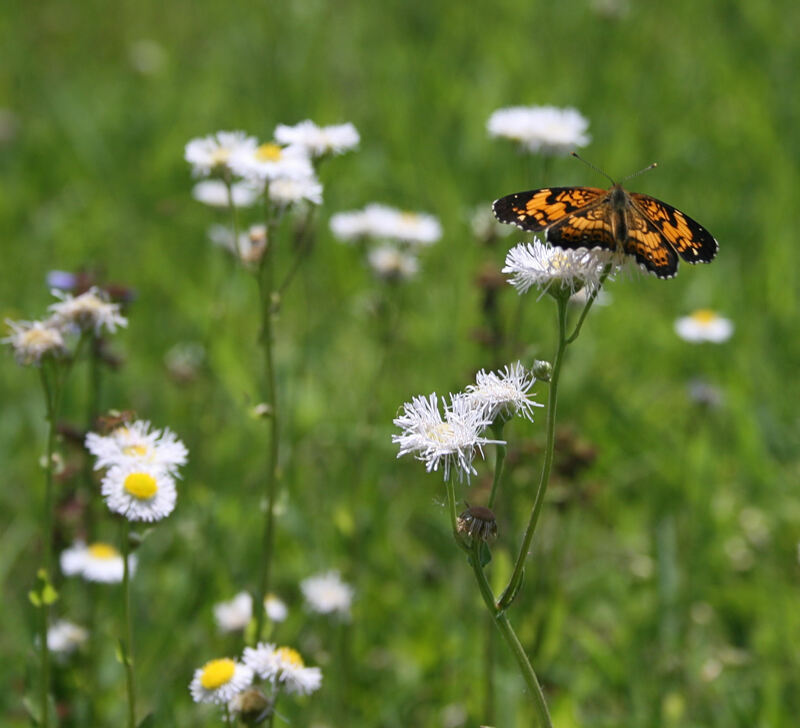 Butterflies on wildflowers made for great photographs. We got up before dawn every morning to photograph sunrises. 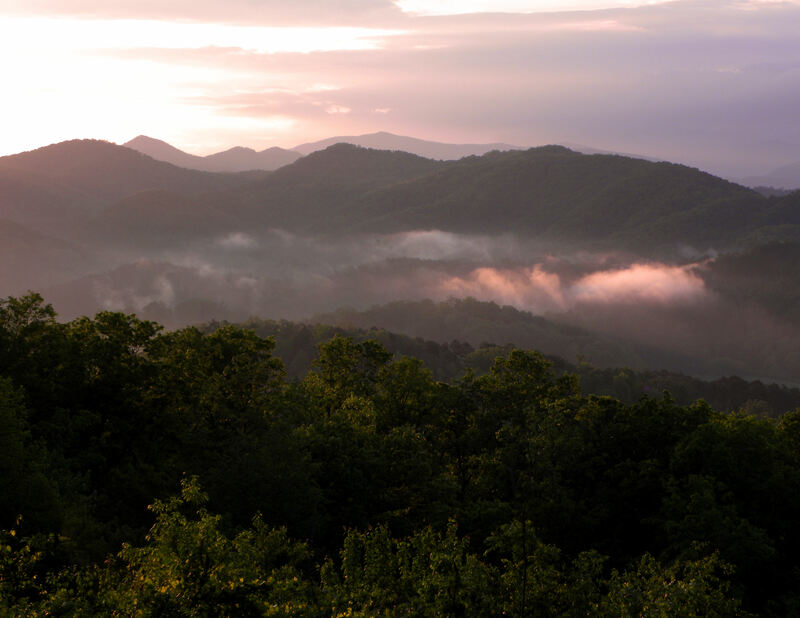 Sunrise in the Smokies was a sight to behold, when the fog in the valleys was washed with pink. 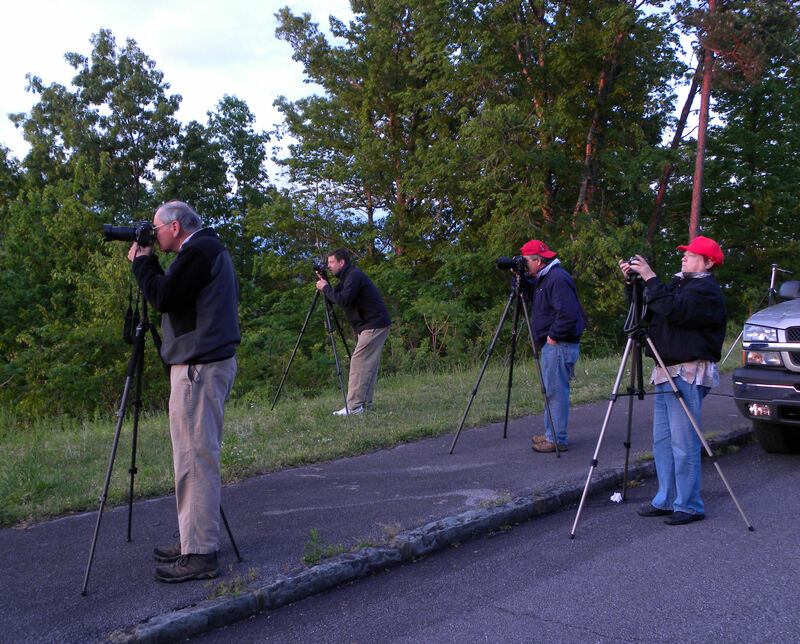 I snapped this shot of photographers waiting for the perfect sunrise moment. Vic was fascinated by these decks and patios on Little River. 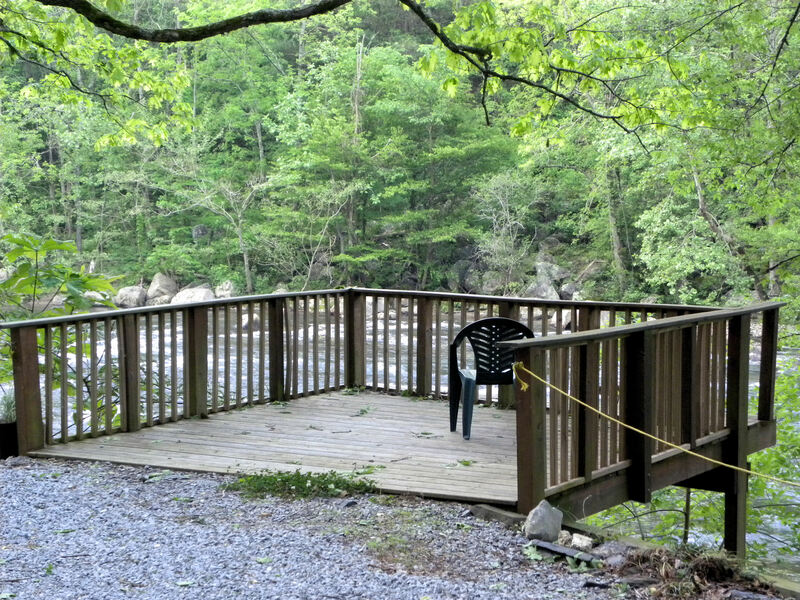 No houses at most of them, just a deck on a tiny strip of land next to the road for enjoying a cookout by the river. 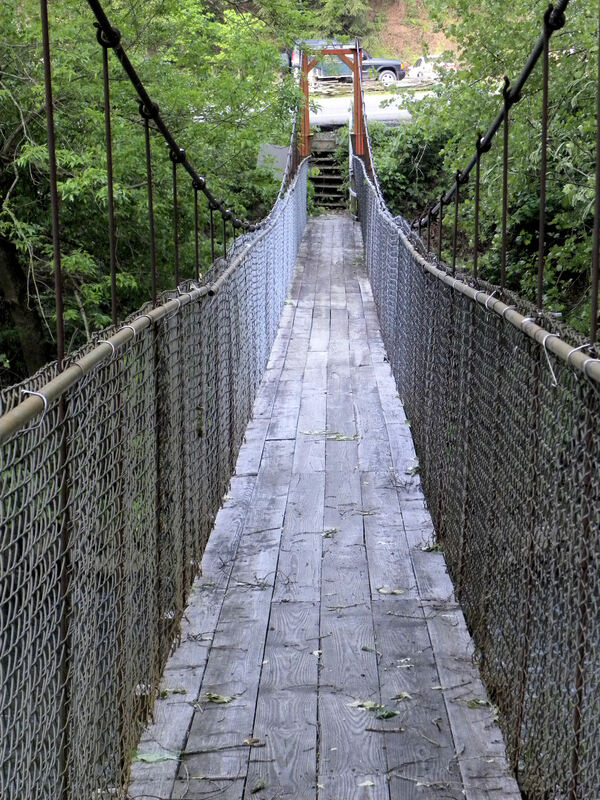 I liked this suspension footbridge over Little River. The food was fantastic. 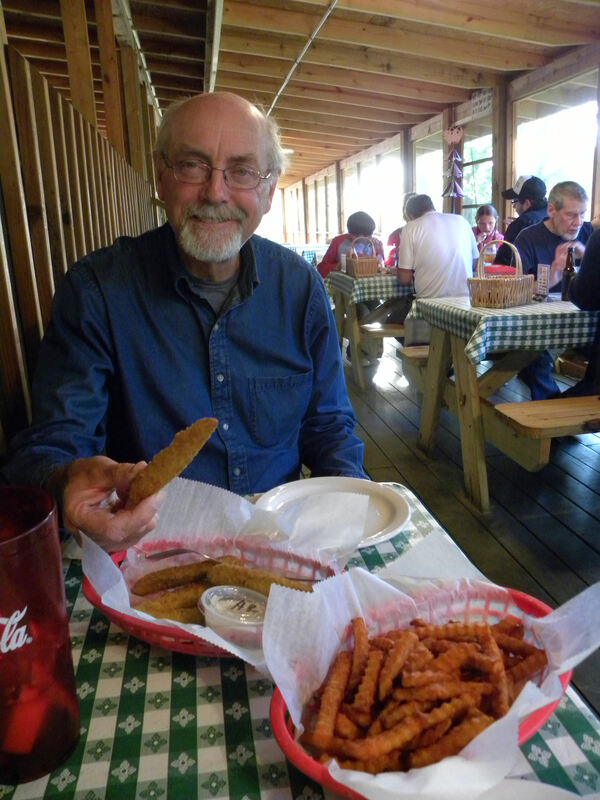 Here Vic is eating a cornmeal-breaded, deep-fat-fried dill pickle spear. They were delicious. We had bbq ribs, pulled pork, sweet potato fries, pecan cobbler, hush puppies, chicken and dumplings, turnip greens, grits, ham with red-eye gravy, biscuits, etc. Oh my, so much good food. We returned on the day that Osama bin Laden was killed. 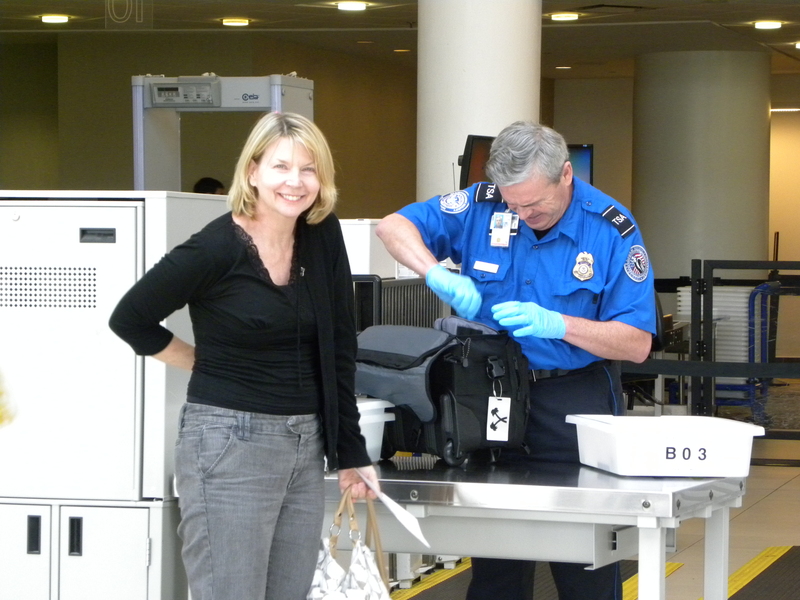 I wonder if the airports were on heightened security because both Wendy and I were subjected to extra scrutiny at the airport in Nashville. What a fabulous trip! I’d go again in a second, only without the tornadoes and hail next time please. To read about the hailstorm, see my column at HBIndependent.com, under columns, Natural Perspectives. I think your unknown red shrub (tenth photo down) maybe Calycanthus? 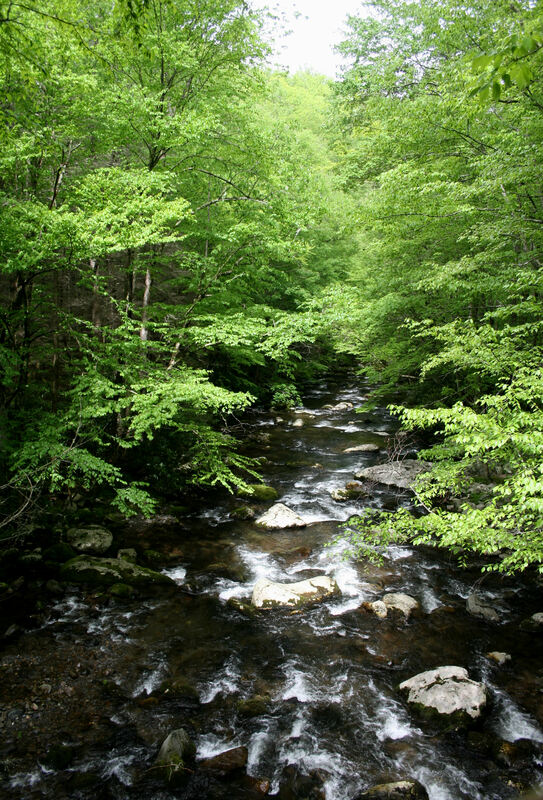 Good you got through that hail and tornado unscathed and were able to enjoy that fabulous trip through the Smokies. Thanks for taking us along. I can’t even imagine a breaded and deep fried pickle! But will take your word for it that it tasted good. So there are still some regional specialties to be had in the US. Yes, Barbara, I’m happy to have made it though alive, considering how many died in tornadoes to the south of where I was. Hi Lou, I also think your mistery plant is Calycanthus occidentalis, I recently researched the plant after photographing it in Yosemite National Park. It is a lovely shrub. 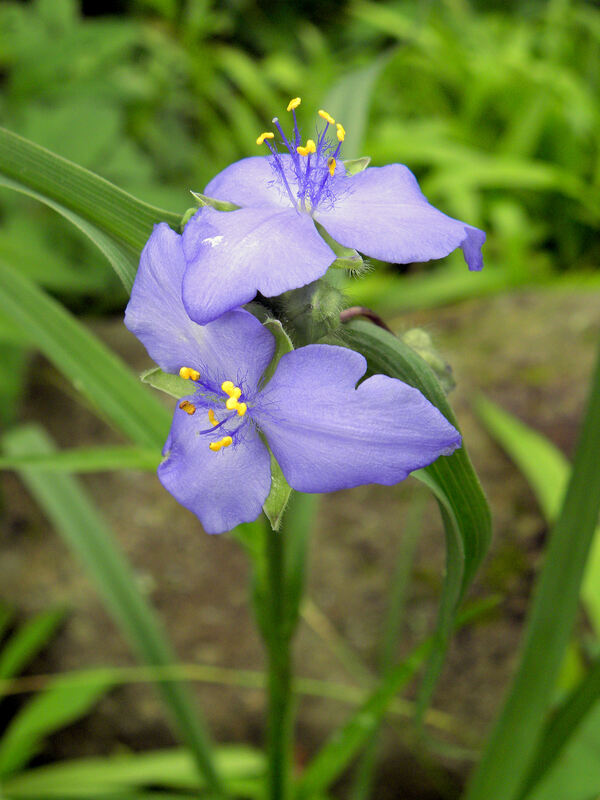 The lavender flower you named trillium is a Spider Wort. 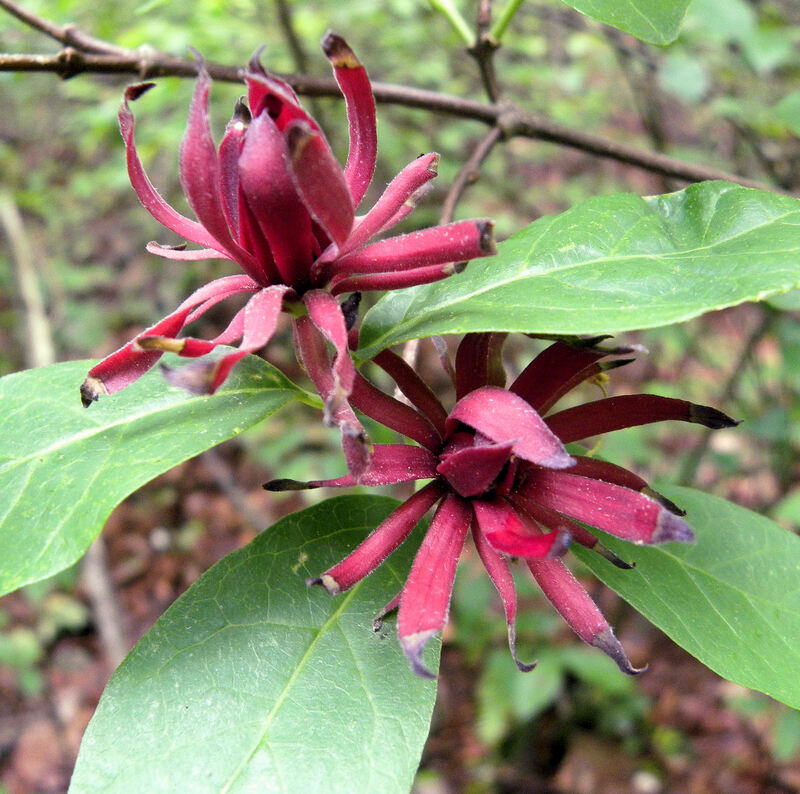 The calycanthus is more commonly known as Sweet Shrub. 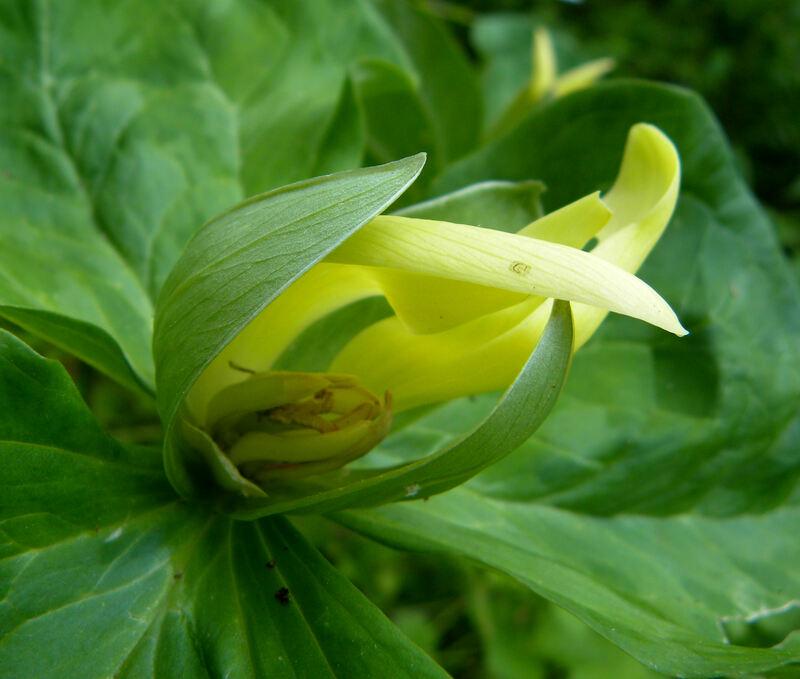 The yellow trillium is also known as Lemon Trillium. 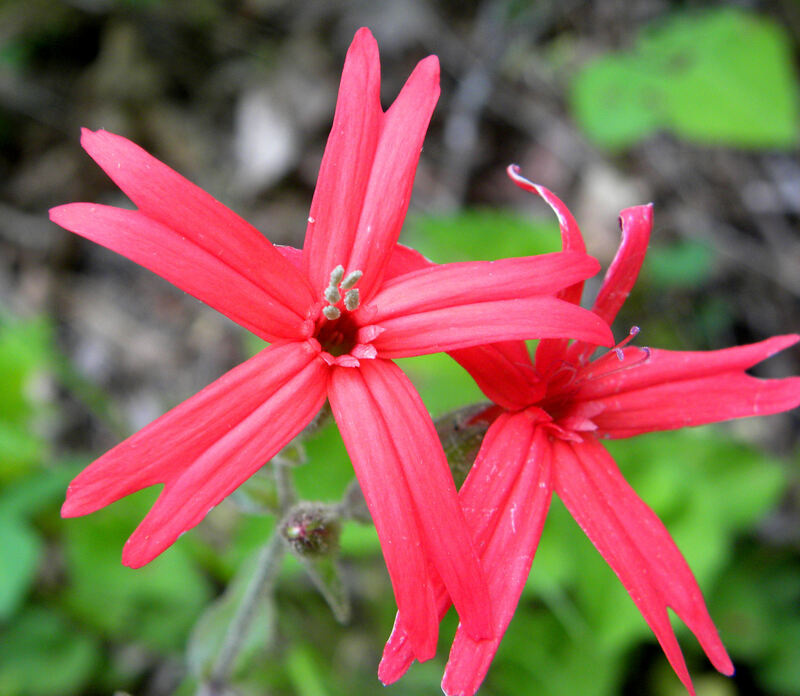 The red flowers are Fire Pink. 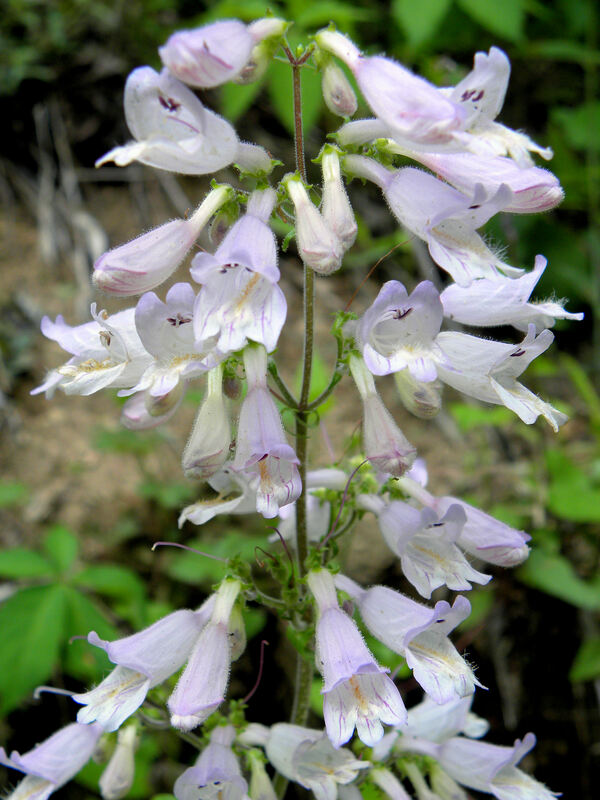 The penstemon is more commonly known as Gray Beardtongue. Sorry you just happened to be here during the severe storm – I got a new roof out of it, and I was one of the lucky ones. 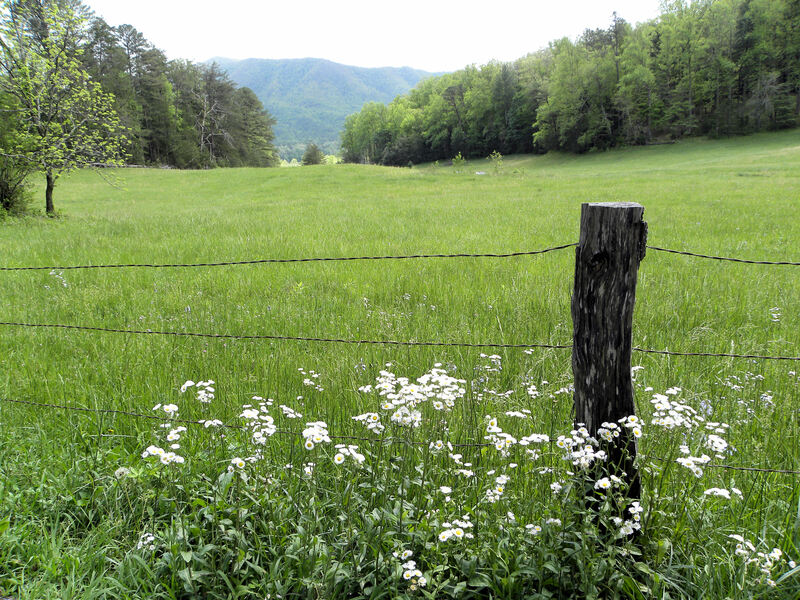 I took a hike on Ace Gap (GSMNP) on May 1, and the adjoining trail was closed, due to blow-downs. We found lots of insulation, vinyl siding, etc. 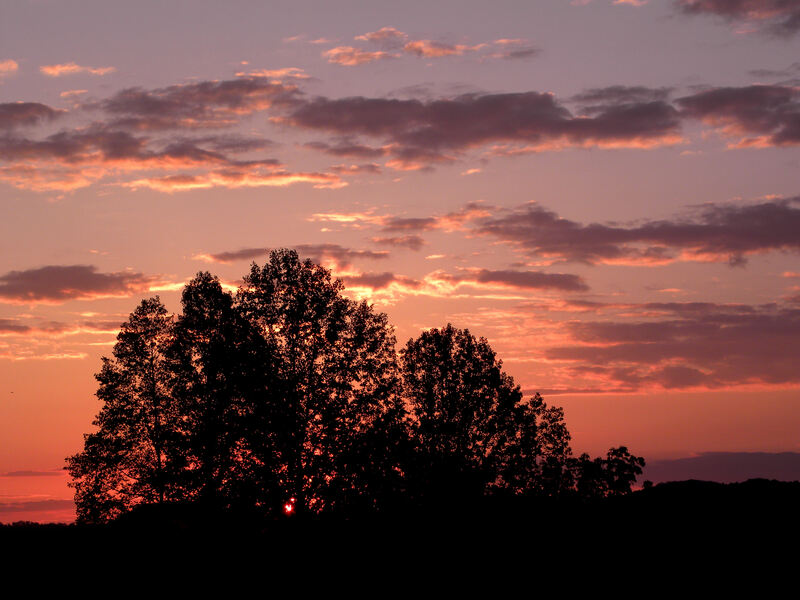 I just love your sunrise pics – wish my camera could get even close to the representation of your camera – it also would help if I lived closer to the Smokies. Thank you for sharing the beauty.